Will Ferguson was named the 2012 winner of the Scotiabank Giller Prize for his novel 419. The announcement was made at the conclusion of a Oct. 30 dinner and award ceremony at Toronto's new Ritz-Carlton aired on CBC Television. Hosted by Jian Ghomeshi, the black-tie event was attended by more than 500 members of the publishing, media and arts communities. It was also live-streamed on CBC Books. "Will Ferguson's 419 points in the direction of something entirely new: the Global Novel. It is a novel emotionally and physically at home in the poverty of Lagos and in the day-to-day of North America. It tells us the ways in which we are now bound together and reminds us of the things that will always keep us apart. It brings us the news of the world far beyond the sad, hungry faces we see on CNN and CBC and far beyond the spreadsheets of our pension plans. Ferguson is a true travel writer, his eye attuned to the last horrible detail. He is also a master at dialogue and suspense. 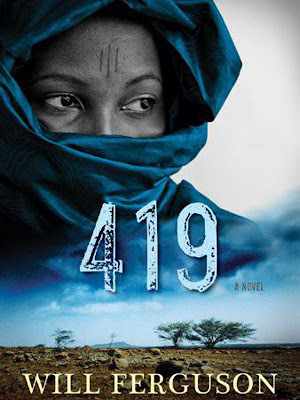 It is tempting to put 419 in some easy genre category, that would only servie to deny its accomplishment and its genius." Travel writer and novelist Will Ferguson is the author of several award-winning memoirs, including Beyond Belfast, Hitching Rides with Buddha and the humor collection Canadian Pie. His novels include Happiness, Spanish Fly and 419. The three-time winner of the Leacock Medal, Ferguson was nominated for both an IMPAC Dublin Award and a Commonwealth Writers Prize. His work has been published in more than 20 languages around the world. During the award ceremony, celebrity presenters included Measha Brueggergosman, Kim Cattrall, Alan Hawco, Rosannagh "Rosie" Maclennan and Rick Mercer. Ferguson, who hails from Calgary, appeared wearing a kilt for the event, and took a swig from a flash that he kept safe in his sporran. The Giller Prize was established in 1994 by Toronto businessman Jack Rabinovitch in honor of his late wife, literary journalist Doris Giller. Scotiabank became the first ever co-sponsor of the prize in 2005, and it's been known as the Scotiabank Giller Prize ever since.